This is quick little post on how to create a force.com site/page to access Salesforce even if you don't have the access codes and to some extent to create your own custom login screen. Generally helpful when same login is shared by multiple user. There are already apps like Trapdoor for mac that lets you do the same, but this one just an cloud version of the same and of course you can build one for yourself! What you need to make this work ? 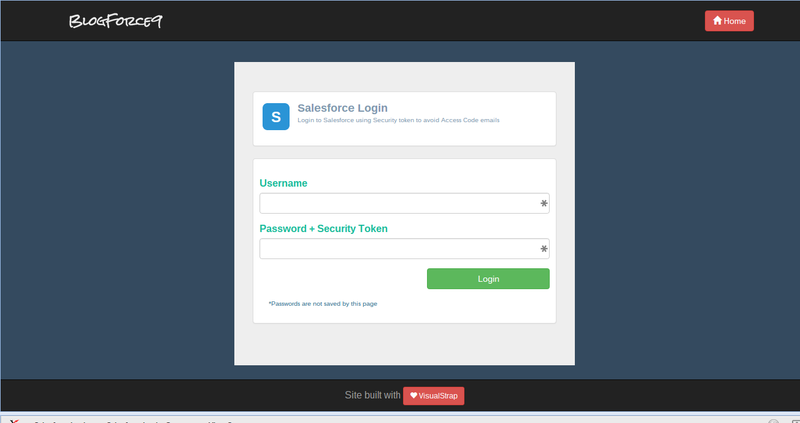 Using the ServerURL and SessionId the user is redirected to "frontdoor.jsp" page of Salesforce which lets user log into Salesforce using session Id. Good work Avinava. Is there any session timeout for frontdoor.jsp approach. Suppose i just want the user to login and do some other stuff, not necessarily take him to setup menu page, then after how long i'd need to ask the user to login again. Also why don't you write a post for social sign on as well. You are doing great.